As you cross Union St. walking west on Front St. you quickly transition from the embrace of downtown into an exposed and uncomfortable environment for the next half-mile to Division St. If you are in a car, the transition is masked by the confines of your own, personalized environment. In the car, you instinctually press the gas pedal a little heavier. Google Street View of West Front. As the adjacent street design opens up–4 story buildings turn to single story businesses or large parking lots, pedestrian lighting turns to more highway style–your speed will increase from the average speed of 15-18 mph in the heart of downtown to a speedometer reading of 26-32 mph. This is the speed for which 60-70% of us are likely to drive in Traverse City’s 25-mph zones designed like the current West Front St. The best speed for urban retail is 3-mph and the goal for this street is a walkable corridor to help achieve a true urban street more connected to the success of downtown and residents in adjacent neighborhoods. Proposed cross section designed by Influence Design Forum working with City Engineering. This year, spurred by $1 million from MDOT’s Roads and Risks Reserve Funding, a major make-over is in motion from the Pine Street Bridge to Division St. This $2.1 project has the potential to be a major catalyst for transforming this corridor into a more efficient and economically prosperous place. The more welcoming it is, the more wallets local businesses will see come through their doors. The design isn’t a complete 8-80 design, meaning it still won’t be comfortable to see eight-year olds and eighty-year olds riding bikes down the street, but increased space and consideration for people on foot along the sidewalks and at the intersections will help improve the street as a place. Mid-block bump-outs, street lighting, and other amenities will also help provide for more crossings and help slow automobile speeds to a more urban context that is safer and more efficient. People accessing businesses and services on this stretch by bike will have additional space as the current conventional bike lane will be widened to an industry standard six feet instead of the current minimum of four and half feet, a.k.a. a car door lane. Tomorrow night the City Commission reviews the project before it goes into final design and eventually out for bids. If you want to review the project and see additional designs, it is described at length in the Commission’s packet. The Performance 2014, a year-end report highlighting many of the City’s accomplishments made over the past year is ready for your viewing! To view the Performance 2014, as well as previous years, visit the City’s website at www.traversecitymi.gov/performance.asp or scroll down and view in browser. Copies may also be picked up at the City Clerk’s Department in the Governmental Center, the Traverse Area Chamber of Commerce or the Traverse Area District Library. The Michigan Department of Transportation has begun a Planning and Environmental Linkages (PEL) process for the roughly one mile of Division St. from 14th St. north to Grandview Parkway. 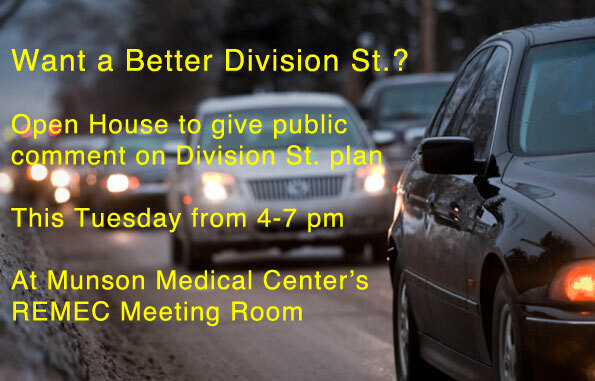 This Tuesday the public is invited to provide feedback on how it envisions a new Division to act. There will be a review of the constraints, traffic information, and, importantly, comment taken on the draft Purpose and Need statement. As a City Commissioner and a representative on the PEL Committee, I’ll be evaluating the process against the values I’ve repeatedly heard from residents: The need for Division St. to serve more than just moving cars and trucks at high speeds and volumes through the City. A new Division St. needs to meet other community needs as well. Increased Safety–For all users traveling along and across, as well as for residents living next to it. High quality–Adds to a sense of place and economic opportunity for the City. Accessibility–A design that elevates the importance of destinations on Division, accessed by multiple modes of transportation. Context–A Division St. that fits into the urban fabric of its context, a mixed use neighborhood of residents and businesses. The basic goal is improved quality of life for the people living and doing business along the Division St. corridor. Previous goals for Division, drafted by a Division Street Committee in 2011, can be found online here and other voices here. Below is the Draft Project Purpose and Need, to be presented to the public this Tuesday December 9. If you have a vision for Division, and something to add to the purpose and need, please plan on dropping in sometime between 4-7 pm. The purpose of the US31/M-37 (Division Street) Planning and Environmental Linkages (PEL) is to improve safety and operations for all users of this designated National Highway System route while minimizing negative impacts to the natural environmental and adjoining properties and enhancing positive benefits to the neighborhoods, parks, businesses, and all users of the corridor. If you can’t make the meeting, you can send comments to MDOT through the project page or by emailing Patty ODonnell, ODonnellP@michigan.gov. What do you envision for Division?